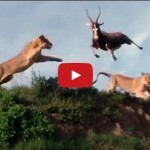 A flying lion leaps from a ridge to catch a fleeing antelope in mid-air. The extraordinary take down happened after a pair of lionesses surprised two blesboks running in their direction. To escape, a frightened blesbok jumped several metres from the ridge – only to be intercepted mid-flight by the hungry lion. As one of the blesboks makes a lucky getaway the other is swiftly dispatched by the fearsome predators.